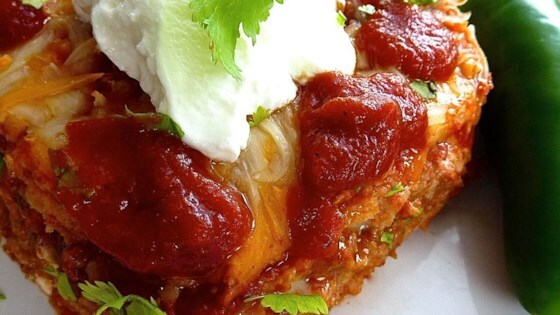 "This is a lower-fat version of a popular Tex-Mex style casserole. You can increase or decrease the number of tortillas used in order to fit your tray. I'm obviously using low- and no-fat ingredients which can be substituted successfully with full fat versions with great results. If needed, this can all be prepared ahead of time and refrigerated to store. Hope you enjoy!" Brown ground turkey in a skillet over medium heat, breaking it up into crumbles as it cooks, about 10 minutes. Stir in taco seasoning mix and water, bring the mixture to a boil, and reduce heat to low. Simmer turkey mixture until thickened, about 5 minutes. Stir in chopped green chilies and remove from heat. Spread a scant 2/3 cup enchilada sauce evenly over the bottom of an 8x10-inch baking dish; top sauce with 4 tortillas, overlapping if necessary. Spread tortillas with half the sour cream, half the refried beans, half the turkey mixture, and 1/3 the cheese blend. Top with another 2/3 cup enchilada sauce and 4 more tortillas. Firmly press down on tortillas to compact the layers beneath. Repeat layers, spreading remaining sour cream, refried beans, turkey mixture, 1/3 the cheese blend and 2/3 cup enchilada sauce onto tortillas. Top with remaining 4 tortillas; press down as before. Finish layering casserole with remaining 2/3 cup enchilada sauce and remaining 1/3 the cheese blend. Bake casserole uncovered in the preheated oven until the cheese topping is melted and bubbling and casserole is hot, about 20 minutes. I used whole wheat tortillas. This dish got twelve thumbs up at my house and it was voted as a keeper and a rerun!! THANKS! Used shredded slow cooker pork loin--delish!